One of my specialties is removing (scratch-free) rancid (old, sticky) and hard to remove cooking oils from spice jars, plastics, and more. I sell my naturally scented homemade degreasing product to my house cleaning customers by request. Scratch-free mineral spot removal from some surfaces (toilets, unpitted chrome and glass, yes, as well as porcelain and fiberglass shower walls or tubs plus some countertops but probably not travertine or slate. Maybe granite and maybe marble to a lesser degree. This work is oftentimes by request, and if the buildup is heavy or the mineral composition makes them super hard or there are aspects of the design (e.g. metals that may change colors) that limit the removal options, it may take a while. Do you know that bleach creates toxic byproducts? I use non-bleach disinfection of toilets that also removes odor. 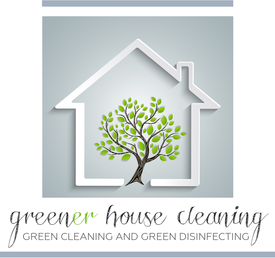 See my Green Disinfecting page for more information. For nonacidic 'green' germ killing (not as thorough as the pro/patented acidic product I use in my service wherever possible) with maybe no residue, know that peroxide breaks down into water and oxygen. It can also kill mold if you leave it on and keep it wet for long enough. ​Quickish (about an hour, depends on the oven), odorless and scratch-free removal of baked-on oven grease. I have one totally green method and one partly but both are odorless, scratch-free and safe for you. Which method I use depends on the type and quantity of grease to be removed. The primary disinfectant I have available for your home is safe enough to leave a thin layer on food preparation surfaces such as laminate countertops, but those like cutting boards should be rinsed or washed before use partly because they would be tart from the citric acid in the product. It has a 24-hour residual effect when left on. For tasks that have no other solution or in the case of green products that are not as effective or are far too expensive for the application, not green by my standard or aromatically pleasant but "safe enough for the situation" products like rubbing alcohol may be used in my service. The biggest exception is the disinfectant I use for my business laundry (cloths), and I do take steps to remove that disinfectant prior to using the cloths on your home. It's not bleach but also not green. I talk about it below. Because I believe in disinfecting my cleaning cloths as they go from one house to another house and because of the volume+cost of disinfectant needed for a wash load, I use a conventional disinfectant for my cleaning cloths, but I take steps to be sure it's fully removed. If you'd like to know which one, please ask me. If you prefer no disinfectant be used, the solution would be to have you get a set of cleaning cloths (ask me which ones I like) to be kept in your home and for me to use when I am there. But this, of course, would mean you do the washing and drying instead of me and in a way that removes all of the grease, all of the soap, and all of the granulars that can scratch surfaces.